In store for midtown Omaha’s 42nd and Leavenworth Streets: a major makeover. The shift would wipe out an art deco-style auto shop that’s been a fixture on the intersection’s northwest corner for five decades. A replacement is to rise on a diagonal corner. That opens the way for the University of Nebraska Medical Center to create a “grand” southern entrance to its expanding campus, most likely a green space with some identifying flair. A new turn lane should ease traffic jams. What won’t leave the intersection (although it would jump corners) is the classic Charlie Graham neon sign — a familiar beacon that since 1969 has stood witness to waves of change brought on largely by growth of the UNMC machine. Champion on Friday sold his business to Great Plains Auto Body — triggering events including a proposed land swap that over the next few years should drastically alter the look of the intersection. Great Plains is to exchange the Charlie Graham corner for a parking lot that UNMC owns on the southeast corner. (The Charlie Graham site is about three-fourths of an acre; the other, just over one acre.) UNMC would be paid a “minimal amount” in the transaction, spokesman Ken Hansen said. 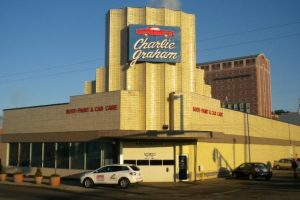 The Charlie Graham operation is to remain at its current spot, with its current staff, until Great Plains erects its kitty-corner replacement. That 15,000-square-foot auto repair facility — which will become the new home for the landmark neon sign — is anticipated to be up and running in 2018. Champion, who built his business with wife Nancy, described the medical center’s acquisition of the Charlie Graham property as inevitable. He said the writing has been on the wall for years, reinforced by recent traffic studies prompted by multimillion-dollar construction projects that reduce area parking spaces and enlarge the UNMC footprint. Already next year, the City of Omaha plans to install a turning lane to improve traffic flow south on 42nd Street out of the medical campus and west onto Leavenworth. That project will cut into outdoor space where Charlie Graham now parks vehicles. Champion — who says he’s too spry to retire but too old to launch another huge venture — contacted Great Plains after he heard that the family-run enterprise was looking to expand. He also engaged UNMC and Omaha city leaders. And the Charlie Graham name will remain. UNMC has no design to share yet for what that Charlie Graham property will become. It also has acquired a smaller parcel just to the north. Hansen said a steering committee most likely will be formed to consider options. Creation of a prominent southern entrance is especially important, Hansen said, as UNMC is set to build the nearby Global Center for Advanced Interprofessional Learning at 42nd and Emile Streets. That $102 million training center, touted as cutting-edge and nation-leading, could be completed in 2018. It will house the iEXCEL Program (short for Interprofessional Experiential Center for Enduring Learning) and would connect via skywalks to the university’s Michael F. Sorrell Center for Health Science Education and the Lauritzen Outpatient Center. The intersection’s southwest corner, which was cleared after a 2013 crash destabilized the building that had been there, will remain an empty lot, UNMC’s Hansen said. As for the new kids on the block, the now-owners of Charlie Graham say they’re excited to join midtown and plan to carry on existing values and services that draw droves of UNMC employees and students. Indeed, Bruce and Joyce Hansen (no relation to UNMC’s Hansen) are similar in other ways to Charlie Graham’s former owners. The husband-wife Hansen team started their auto repair business three decades ago, a year after the Champions bought Charlie Graham. Like Nancy Champion, who has overseen Charlie Graham books from the get-go, Joyce Hansen was hands-on with Great Plains’ finances. Today, the Hansens’ son, Matt, and his wife, Erin, handle day-to-day operations of the enterprise that’s grown to nearly 90 workers at four shops. The three others are at 145th Street and Industrial Road, 109th and West Maple Road and in Council Bluffs. Though the three other shops focus on auto body and collision repair, the latest acquisition opens the gate to mechanical retail services such as break jobs and oil and tire changes, Matt Hansen said. Originally built in 1942 as a Hinky Dinky grocery, the structure that Champion describes as art deco with a glazed tile exterior was transformed to an auto body shop when Charlie Graham bought it. Best that Champion can tell, that was around 1969, when Graham erected the sign featuring a crumpled car that becomes whole. At that time, Graham’s downtown Omaha Buick dealership had grown too big, so he opened the 42nd and Leavenworth location to handle body repair. Graham retired in his early 50s, moved back to California and sold the auto shop to two employees in 1977. Champion started working there in 1983 as a collision repair technician and four years later became an owner. The native Omahan — known also as the “auto guy” who gives car tips on a local TV station — declined to disclose financial details of Friday’s sale. The overriding feeling this week, Champion said, was relief. Credit to cindy.gonzalez@owh.com, 402-444-1224 author.